2018 marks the year of an enhanced, limited-edition model of the Volkswagen Passat. Debuting at the North American International Auto Show, the 2018 VW Passat GT Special Model reflects a transformation of the beloved model with approximately 20 sporty upgrades inside and out. 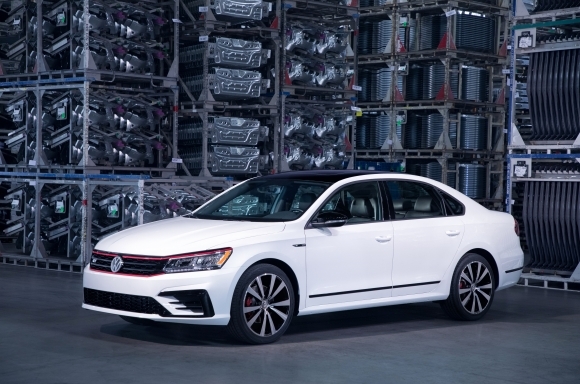 The 2018 Passat GT Special Model is “the most aggressive looking Passat yet,” and is powered by the intense 3.6-liter VR6® engine mated to a standard six-speed DSG® automatic transmission with Tiptronic®. The transmission is equipped with steering wheel-mounted paddles shifters, and the powertrain generates a heart-thumping 280 horsepower and responsive 258 lb-ft of torque. The 2018 Passat GT is priced at $29,090 with an $850 destination charge and “every 2018 Passat model comes with the People First Warranty, America’s best bumper-to-bumper new vehicle limited warranty,” reports Volkswagen. To up its performance aesthetic, the 2018 Passat GT exterior is accented with blackened LED taillights, black bumper trim, black spoiler, black mirror caps, black door and window trim, and a black roof. “Starting at the front, Passat GT differentiates itself from standard Passat models with standard LED headlights and LED Daytime Running Lights (DRLs). It borrows the R-Line® bumper and adds a honeycomb grille, GT badge, and a red accent line, reminiscent of the high-performance Golf GTI. A sport suspension gives it a more planted stance and cements the aggressive look,” according to Volkswagen. The cabin of the 2018 Volkswagen Jetta is awash with comfort due to its standard eight-way power driver’s seat, dual-zone Climatronic® automatic climate control, leather-wrapped steering wheel, and heated front seats. Heated side mirrors are also a standard feature. The 2018 Passat GT wouldn’t be a proper Volkswagen without some impressive tech to keep you entertained and connected while on the road. “The Passat GT features a Composition Media infotainment unit with 6.3-inch capacitive touchscreen display and standard Bluetooth® for compatible devices, Voice Control, and Volkswagen Car-Net® App-Connect technology that offers compatible smartphone integration with the three major platforms — Apple CarPlay™, Android Auto™ and MirrorLink®. GT models feature two USB ports — one in the center console and one in the rear seat console. SiriusXM® Satellite Radio is standard and includes a three-month trial,” reports Volkswagen. The R-Line® inspired 2018 Passat GT comes in four colors: Reflex Silver, Pure White, Deep Black, and Platinum Grey.